Yam is a tuber and is full of starch. There are about 200 varieties of this vegetable. It is long and cylindrical in shape, and is rough to touch. Yam is a rich source of energy and also Vitamin B Complex, Vitamin C, antioxidants, minerals, fiber and complex carbohydrates. Vitamin A is found in small quantities in this vegetable. You get 118 calories from 100m gm of yam. Yam is a rich source of beta carotene, Vitamin B6, Vitamin C and antioxidants, which help in preventing the signs of ageing like wrinkles, fine lines and so on. Yam can protect your skin from the harmful effects of the sun and other environmental problems, because of the presence of antioxidants in it. It improves the production of collagen, thus retaining the elasticity and smoothness of the skin. It also repairs damaged skin and improves the texture of the skin. Vitamin A present in yam helps the scalp to produce natural oil and also prevents its loss from the scalp. As a result, the scalp will always remain hydrated and you will not suffer from hair fall or hair breakage. It also keeps your hair smooth, silky and shiny. The presence of beta carotene, anthocyanins and Vitamin A makes yam an excellent food for healthy hair. If your body is deficient in beta carotene, your hair will turn dry and dull, and flakes may form on the scalp leading to the formation of dandruff. Yam is rich in iron and this helps RBC in the blood to carry more oxygen to the scalp. This in turn increases the blood circulation in the scalp, resulting in healthy and strong hair. If your body is deficient in iron, it may cause loss of hair and baldness. Being a rich source of Vitamin B6, yam aids in increased production of melanin, which provides color to the hair, and thus prevents premature graying of hair. Yam is good for preventing constipation because of the presence of dietary fiber in it. This fiber also helps in decreasing bad cholesterol in the body. Being rich in potassium, yam helps in proper digestion of food and improves muscle contractions of the stomach for the smooth movement of the bowel. Yam is good for preventing cancer, especially colon cancer. The dietary fiber present in yam helps in preventing toxins from getting accumulated on the colon mucosa and thus prevents colon cancer. Yam also contains Vitamin A, which protects the body from oral cavity cancer and lung cancer. Being rich in complex carbohydrates and fiber, yam slows down the rate at which the sugars are absorbed by the body. The fiber present in yam makes it an ideal food for those on a weight loss diet. It makes your stomach full and prevents you from over eating. Manganese present in this vegetable is important for carbohydrate metabolism and also provides you with increased energy. It also has antioxidant properties. Yam contains allantoin, which has a healing property when applied topically on the skin. It can cure boils, ulcers and other diseases of the skin. A decoction made from yam has the power to get you relief from cold, cough, bronchial irritation and respiratory problems. Yam is rich in various minerals. Copper in yam aids in the formation of red blood cells and enhances the flow of blood in the body. Iron is essential for maintain proper blood circulation in the body. Manganese is another useful mineral found in yam. Consuming yam juice regularly helps the body to absorb nutrients more efficiently. It also helps in keeping the cells healthy by protecting the enzymes needed by them. Yam juice makes it easier for the body to absorb all the vitamins and nutrients. Having yam juice regularly greatly increases your memory power and learning capacity. It is also beneficial for curing Alzheimer’s. The low glycemic index of yam makes it an ideal food for the diabetics. They can have it without any fear that the level of blood glucose may increase. Yam cause a rise in the level of blood sugar very slowly and therefore is safe for diabetic patients. Vitamin B6 is found in high quantities in yam. This vitamin is essential for breaking down homocysteine in the body, which can cause damage to the walls of the blood vessels. If homocysteine is found in high levels, it may even lead to heart attacks in spite of having low cholesterol levels. So, you need to have enough amount of Vitamin B6 to prevent heart problems. Potassium present in yam helps in keeping the blood pressure under control and also controls the heart rate. 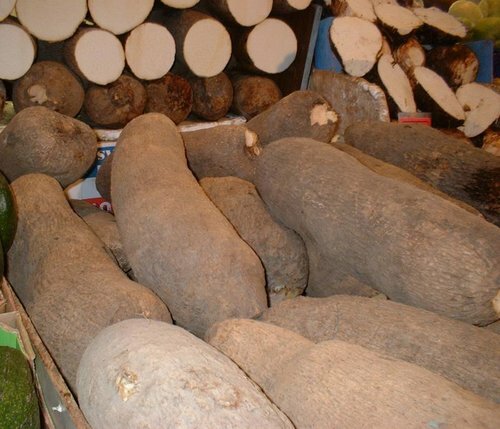 Yam is also rich in Dioscorin, which is a storage protein that is beneficial for those suffering from hypertension. Yam is of great benefit for menopausal women. During menopause, hormone replacement takes place in women. An enzyme present in yam helps compensate this problem in a natural way. Wild yam is good for the endocrine system while B6 present in yam is beneficial in treating premenstrual syndrome, especially depression. Yam also provides you relief from nausea during pregnancy. Yam is rich in antioxidants, along with anti-inflammatory properties. Vitamin C and beta carotene present in yam help in destroying free radicals that cause cancer. It is also very beneficial for people suffering from asthma and arthritis.